Culture for Community is a unique group of Yerba Buena district arts and culture institutions who have joined together to open their doors for free. The inaugural free day on Thursday, March 21 honors Womxn’s History Month and carries the sub-brand Culture for Womxn. Following a series of cultural shifts driven by and impacting womxn, including the Women’s Wave of elected representatives in Washington D.C., the #MeToo movement, and threats to transgender rights, Culture for Community is tapping into the collective communities to amplify a broad cross-section of womxn’s issues. 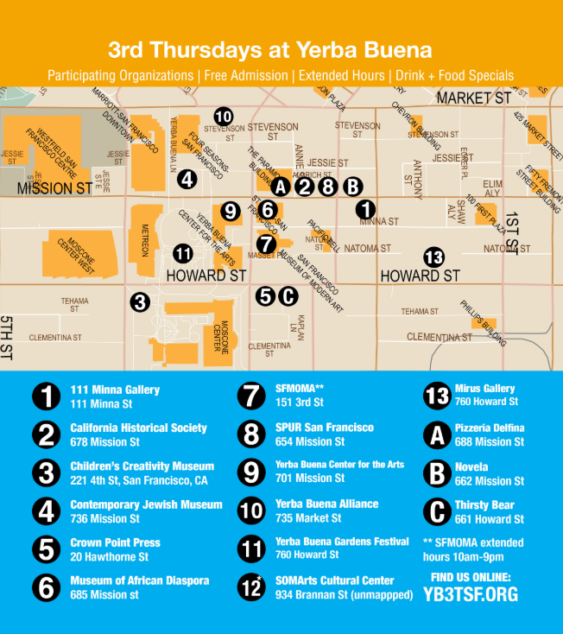 Join for a full day of special events, activities, and museum and gallery hopping throughout the Yerba Buena Neighborhood. The Yerba Buena community includes some of the top restaurants in the City, and some are participating in Culture for Community with special offers on March 21 to individuals attending institutions on the list above.